Technology is responsible for many changes, and food is no exception. Just about everything we eat has been genetically modified, treated with chemicals, and altered in some form or another in the name of “productivity.” Candy is no exception. Why, chocolate isnâ€™t even real chocolate half the time, and sugar went out of the window long ago in America in favor of corn syrup. Do you even remember a time when you could buy a packaged candy bar that wasnâ€™t made with artificial flavors or colors? 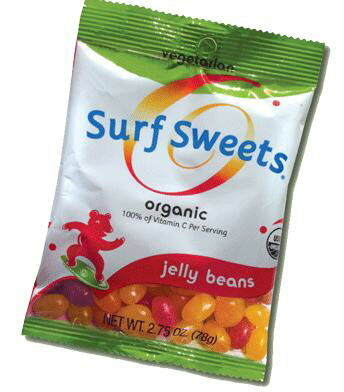 That is why itâ€™s refreshing to discover there are candy companies out there like Surf Sweets, recently acquired by tru sweets (a company of identical ethical food practices). 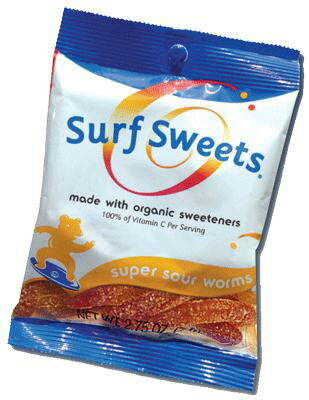 Surf Sweets, a company native to hippie Santa Cruz (go Banana Slugs! ), is steeped in a philosophy of admirable food values. I had never heard of this particular brand of candy before, but I am familiar with similar lines, such as Sun Ridge Farms. 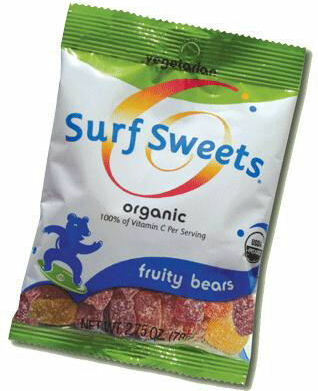 These companies all share the commitment of providing healthier alternatives in the candy world by manufacturing organic products that are usually free of common allergens; refrain from the use of corn syrup, artificial colors and flavors, and often regular sugar; and offer a variety of vegetarian and vegan products. The wonderful folks at Surf Sweets sent me their entire product line, and not even in small bags, but in the full-sized packages. So before I give you my review, I just wanted to bestow a special thanks for that thoughtful gesture. So these are gummy bears that are coated in sugar. Opening the bag, they smell like a variety of different jams and jellies, each fresh and rich in fruit tones. They are your standard-sized bears. Of the five flavors, I’d have to say that red was my favorite. It was a woodsy cherry, strong, and oddly artificial, but in a natural fruit leather way. Artificial, but natural? Think of the way grapes donâ€™t really taste like grape juice, but grape juice is still natural. It is the boldest of the flavors, not tart, and my favorite. The other flavors, including lemon, strawberry, orange, and grapefruit (I think) were all good, though some were a bit on the mild side. They aren’t sticky, but donâ€™t quite chew like a gummy, since there is no gelatin in them. The sugar coating is more for texture than taste, and I could have easily done without it. Still, not bad overall. The size of these is akin to medium-sized, bi-colored sectioned gummy worms. They in general had a better gummy texture than the fruity bears, but still did not have the true essence of a gelatin gummy, and were prone to breaking in the bag. I found these tart rather than sour, and only so because of the actual candy, not the superfluous â€œsourâ€ coating. Many of these are loaded with different flavors of citrus, releasing lovely grapefruit and tangerine overtones. I was reminded a great deal of Rowntree Fruit Pastilles, which is one of the highest compliments I think you can bestow on a candy. They are delicious and I could eat a whole bag of them. These gumdrops are about half the size of your standard gumdrop. Each is coated in the identical sugar as the fruit bears and super sour worms. They are comprised of a white base that is swirled with another color/flavor. When picking out the pieces, I noticed they were not uniform in size. These have similar flavor to the other products, but combined with a creamy base. The texture is a bit odd for a gummy, but enjoyable. The orange is especially good, as it tastes like a Creamsicle in gummy form. Each is fragrant with a spot-on coloration and appearance for regular gummy worms. 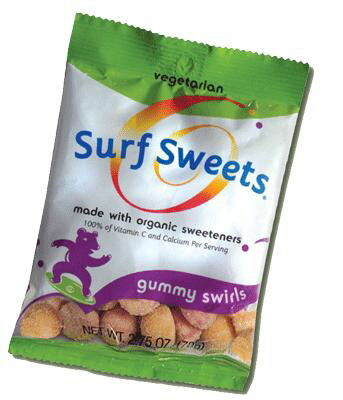 Because of the added gelatin, unlike the previous products these are not vegetarian or vegan friendly; the upside to this addition is that it has a perfect gummy chew that is soft from freshness and no stick factor. The flavors are rather contained, but richer than your standard worm. I wasnâ€™t able to specifically pick out any fruit flavors, but there was a fruity blend of various notes. Aside from the fact that these have bulging eyes, youâ€™d never think they were different from any other gummy bear. They mimicked the gummy worms in terms of a wonderful chew. These too contain gelatin and are not suitable for vegetarians or vegans. My favorites of these were easily grapefruit (yay! I love me some grapefruit, and itâ€™s rare to find it in gummy form) and lemon. They had the strongest flavor and were slightly sour. The other flavors were rather muted, but still good. Each piece is a translucent pastel color that makes them great for Easter. The shells are firm, but the insides are chewy/gummy (like gum). There is a slight chalk to it, but still wonderful to make your way through. These are suitable for vegetarians. The flavors in these are matches for the other products and only offer a twist in the way they are packaged in the jellybean form. A must for lovers of this sort of candy. So here is my overall breakdown of the six products. I want to start with the cons, mainly because there are so few of them. First, I wish theyâ€™d advertise which flavors are apart of each set, as it wasnâ€™t always apparent. Second, I wish there were other flavors that the line carried instead of recycling the same one from product to product (grape, for instance). Third, it’s really hard to differentiate the colors between some of these! As for the pros, first and foremost, these rock! It doesnâ€™t matter whether youâ€™re a vegan, mindful of your allergens, or just a lover of candy: I wasnâ€™t disappointed with any of the six products, highly recommending them all. My personal favorites were the sour gummy worms and gummy swirls because I found them to contain the most novel twists on the classic products they represent. I shared these with my vegetarian roommate and her boyfriend, and they were so won over that they are committed to going out and buying their own bags, so itâ€™s not just me who fell in love with them. If you are interested in purchasing these, you can find info on their website. As far as finding them in stores, they are supposed to be carried at Whole Foods and Toys R Us. Iâ€™m not going to lie and say eating these are inherently better for you than eating an apple. Compared to picking up the standard gummy bear that is chock-full of chemicals and what not, well, the science behind those additives is debatable, so it would be wrong of me to state outright that these are superior. Thus, I will stick purely to the facts: these taste fantastic, and you should buy them on that merit alone (though the health pluses in them are definite bonuses). Hate to say it but just the word ‘organic’ next to candy makes me bail. No thanks. I want my candy to be bad for me with no nutritional value.